Hola to all my family and friends and HAPPY HOLIDAYS to one and all. In my mind I have written this letter/blog everyday for several weeks and still find it somewhat difficult to type the words. Since September 4th, I have been in California learning many new lessons. Some of you know that I have been the live-in caregiver for my friend, Adrienne, who is my son Aaron’s mother-in-law and was on hospice. It is different for a hospice nurse to be the 24/7 caregiver and not be in charge. Fortunately my daily meditation pushed and pulled me along through the ongoing challenges. I am reminded of a children’s book on death by Alice Walker To Hell With Dying, nothing is predictable. 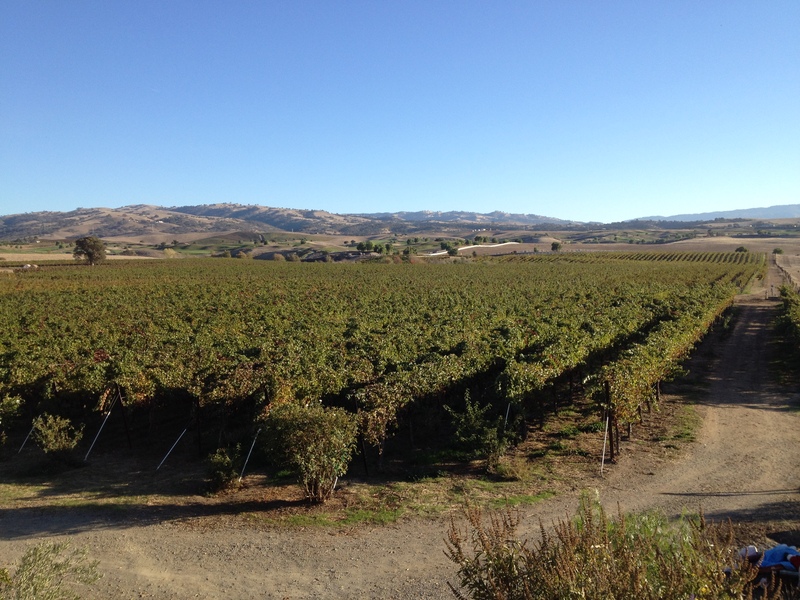 A blessing of being with Adrienne was living in her beautiful environment in the vineyard and watching the gorgeous views many times throughout the days as the sun changed the colors of the vineyards and the hills. The trees and grapevines changed colors before our eyes. It is no wonder that Adrienne became an accomplished watercolorist after she retired from teaching. The vistas outside her windows were inspiring. Sadly Adrienne made her transition on December 3rd relieved from her physical suffering. I want to thank all of my children for honest communication during these past three months. Thanks to my and Adrienne’s friends who encouraged and supported me throughout this new end of life experience. Thank you, my friends in Nicaragua who kept me informed about my home there and sent me hugs that said you missed me. After Adrienne’s transition, I flew to San Juan Capistrano, spent ten days with Rivka and Brian and actually got to see my grand daughter, Esther, for a day. Esther took the train home from school in Santa Barbara for the weekend of Brian’s 49th birthday. Can’t believe these “kids” are getting to be middle aged–IMPOSSIBLE! The Bents drove me with them down to San Diego for a day. Rivka works in San Diego and drives there everyday. Brian has had a studio/shop in SD–“The Hot Rod Garage Sale”–but is closing it on Dec. 19th and will have a huge sale at their house in SJC on the 19th. 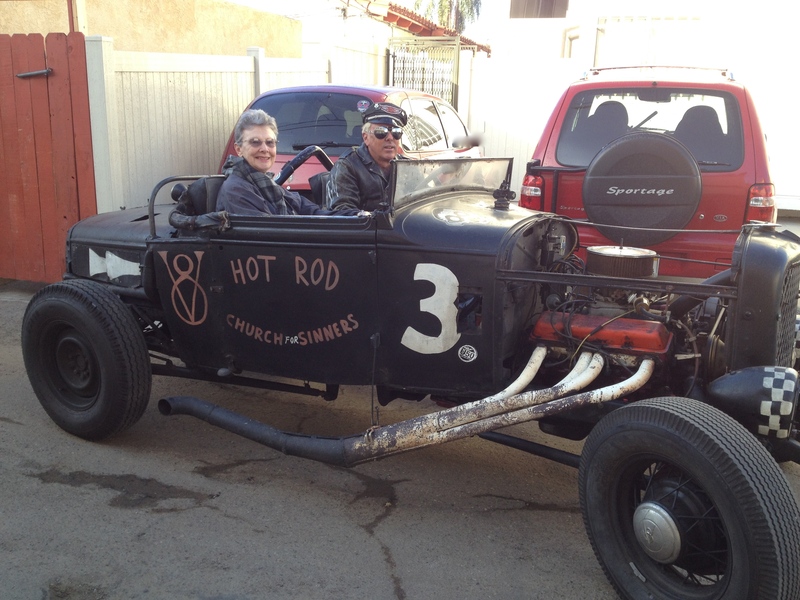 Brian took me for a SD tour in the Model A Hot Rod that he built. It was a hysterical site to see me crawling over the rear tire to get into the seat. On Dec. 13th, I flew up to Hayward and stayed at Connie and Joel Clark’s place in their mother-in-law apartment. Connie and Joel are considered Rivka’s second family. They lived across the street from the first Hayward house that Lennie Wilker and I owned. Connie and I share the same Gemini birthdate so you can image the whirlwind of activity that we had for five days. We accomplished more in those five days–in between rain bursts–than most people would attempt. The Clarks dropped me off at the Oakland airport to pick up a rental car for the remainder of my stay in No. CA. I am heading to the Smith’s in Dixon for the annual Christmas events with our family plus Aaron’s and Tim’s birthdays on the 22nd and 24th. For the New Year’s holiday I will be at my brother Paul’s home in Gold River. He and Louise will take me to the Sacramento airport on Jan. 3rd for my return home to NI. I was able to spend time with each of my children and their families. Greg and family had me for four days over Thanksgiving. Needless to say, it has been one interesting gig for me back in the US. The sun is now shining. There are cookies on the kitchen counter of which I am measuring out to last for two days. I love home made cookies. Think I will start baking again when I get back home to NI. Oh, yes, I forgot to mention that I will be moving back into my condo at Rancho Santana on January 7th. I have only lived in the condo for a total of 13 days since it was built. Living in the Guzmán casita in Limón #2 has been a great opportunity to immerse myself and speak Spanish and to experience once again living in a rural/farm environment. Conditions in the Guzmán compound are similar to those of the farm where I was born and lived until I was 12 years old. Fun times. Remember to take care of yourselves in this busy time and enjoy each blessed day.